The soup in Japanese ramen starts out as a soup stock, which is blended with a special flavoring sauce right before it is served. The soup stock can come from a large variety of sources: the meat and bone of chicken, pork, or beef, fish stock from dried bonito, sardines, mackerel, or vegetables such as shitake mushrooms, onions, green onions, etc. Many ramen stores will even blend different soup stocks together, where they cook the soup stock from pork bones and seafod separately and blend them right before they serve the ramen. The flavoring sauce, or たれ(tare), that is added to the soup stock can be categoraized into three main groups: shoyu (soy sauce), miso and shio (salt). The flavoring is not as simple as just adding soy sauce to your soup stock. The creation process for the sauce can be a long and complicated one as well. Some ramen stores will infuse the flavoring with other other spices, basic ingredients include fried garlic, chile peppers, shallots, green onions, fried sesame seeds, or different types of sake (rice wine). The recipe for these soup flavorings are closely guarded secrets, where in some ramen chain stores only the top owner knows how to make this secret sauce. Ramen stores in Japan are constantly innovating, trying to come up with new flavors and combinations to attract new customers. Many of the newer shops don't stick with the simple formula of a soup stock + a flavoring sauce. 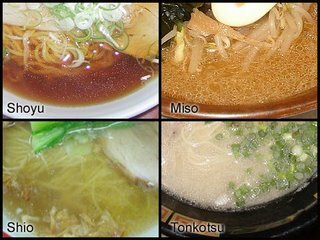 Now a days, you will find ramen that is a blend of tonkotsu soup and fish stock, with flavoring that is shoyu based, some places blend miso soup with a thick sesame sauce (坦々麺), or even a shoyu based soup with a lot of curry. The Soup - is always the first area I talk about when writing about the flavor of a ramen shop. Hopefully this will better help you categorize and understand the many soup flavors for Japanese ramen.